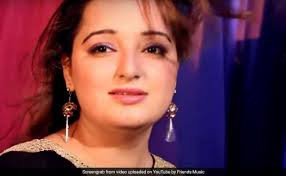 In yet another incident of violence against women artistes in Pakistan's Khyber Pakhtunkhwa, actress and singer Reshma was recently shot dead allegedly by her husband in Nowshera Kalan area. According to a report by Geo TV, Reshma, who was the suspect's fourth wife, used to live with her brother at the city's Hakimabad area. Police revealed that the suspect had entered the house and started firing at his wife, following a domestic dispute. He then managed to escape the crime scene. Known for her popular Pashto songs, Reshma had also acted in the famous Pakistani drama 'Zhobal Goluna'.